A couple of weeks ago I received a phone call from Percy Piestewa to tell me that her husband, Terry, a Vietnam veteran, had passed on. Percy’s phone call meant so much to me. 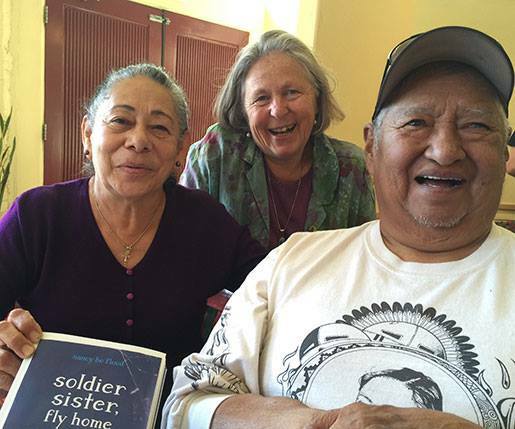 Terry and Percy welcomed me into their home when I was writing Soldier Sister, Fly Home, a middle-grade novel dedicated to their daughter Lori, the first Native American woman to die in combat on foreign soil. During our several visits we laughed together, cried together, talked story together. Both Terry and Percy have done so much to heal others, to create peace, and to bring people together. They have welcomed everyone to their home without exclusions. Without judgments. Terry’s gentle smile and kind words will be missed.